How to Find a Mentor: in a Medical Profession and Otherwise! Mentorship is an invaluable component to any aspiring doctor’s journey. It provides direction in the midst of overwhelming decisions, encouragement when the road gets bumpy, and specific insights into your field of interest. 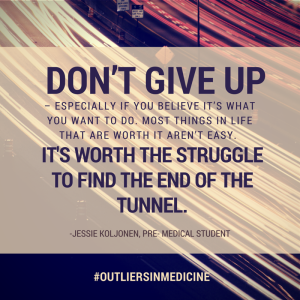 Jessie Koljonen, doctor in the making, shares her experience with mentorship in our upcoming book and eBook series, Outliers in Medicine. Jessie has a background marked with many high achievements: She completed her undergraduate degree in Behavioral Biology at John Hopkins University, and has been involved in numerous medical organizations, building her resume and getting practical experience in the field of medicine, during her undergrad and after graduation. In 2011, Jessie was named “City of Phoenix Outstanding Young Woman of the Year” for District 6. While Jessie is undeniably a talented young woman, she believes her talent is only one component of what will be a successful career, and behind the skill has to be passion. If you are not passionate about what you are doing, you have the potential to wander aimlessly through your studies on autopilot, or even flounder at the first setback. One way that Jessie realized her passion and decided focus of studies in medicine is through a few key relationships she built during her years at JHU. In the beginning of her college career, Jessie declared a major in Neuroscience. Being the outlier that she is, she decided early on that she would be more effective with the leadership and guidance of others more experienced than her, to get the most out of her studies. She started by building a relationship with the department chair, and next began shadowing a neurosurgeon at Hopkins Hospital, soaking up tangible experience and words of wisdom from both. Although these women encouraged her in her current focus, they also guided her in her struggles to help her find what would be a good fit for her. I will save the specifics for you to read in her upcoming chapter, but ironically, the relationship with these professionals who existed in the realm of her dream career, ended up steering her into a path she had not originally imagined. Jessie switched her major from Neuroscience to Behavioral Biology which she feels will broaden her horizons and ultimately aligns better with her passions. Although Jessie always had a plan in her back pocket, these influential figures in her life helped her realize the road to your dream career isn’t always straight, and the adventure lies in the curveballs life throws at you. Today, Jessie is currently working on her Masters of Science in Biomedical Sciences at Tufts University, while applying to medical schools, all the while maintaining a relationship with her mentors back at Hopkins, and open to “wrinkles” in her plans that might lead her to a better future! Although finding a mentor may seem far too intimidating, it is absolutely attainable. We’ve highlighted a few insider tips from thebossmag.com (applicable to any profession) and aamc.org (specific to aspiring physicians) on what it means to have a mentor and how to land one of your own! Someone who has been in your shoes—hearing the trials of triumphs of your mentor will give you perspective. Plus, you can get advice specific to the outcome you’re aiming to achieve. Someone who challenges you— a truly helpful mentor will push you to improve, introduce you to new ideas, and provide you with hands-on learning opportunities along the way. Someone who is willing to invest time in you—a mentor should be accessible and engaging during your time together. Just keep in mind that a quality mentor is likely very busy… you may have to put in a substantial amount of legwork to get your relationship off the ground! Get involved—volunteer or work in a medical program to strengthen your network and rub shoulders with accomplished professionals. Use your connections—if you don’t find any prospects through friends or family, look into your school’s alumni network, local medical societies, or hospitals that have mentoring programs. Step out on a limb—if there’s superstar surgeon you admire from a distance, take action! Introduce yourself through email, or even better yet, in person if you have the chance. It may take some trial and error to find a good fit, so don’t let a few “no’s” defeat you! For more valuable insights on mentorship and the journey into a medical profession, check out the Outliers of Medicine series here.